Large flat rocks make the perfect place to set up a picnic lunch while enjoying the picturesque mountain scenery of the Mealy Mountains in Southern Labrador, Canada. As the waterfalls crash down the mountain slopes, a helicopter in the backdrop awaits its passengers return after their picnic lunch. If looking for serenity and a peaceful place to enjoy a picnic, this mountain wilderness is ideal, but the cost to get here may be a little more than planned. 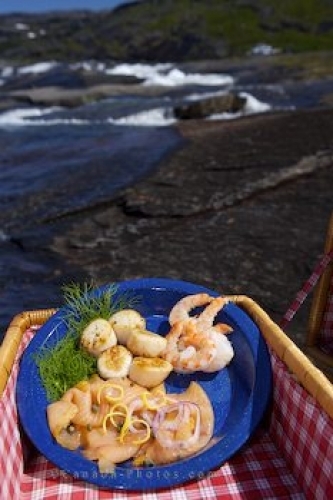 Not everybody can lavish in a gourmet picnic lunch surrounded by some of Southern Labrador's most beautiful areas. Picture of a picnic surrounded by the beautiful mountain scenery in Southern Labrador, Canada.